Humor is a really great medium to remove boredom and to start a nice and easy conversation anywhere anytime. Nothing can make you laugh like sharing a few hilarious jokes with your closest friends. Here we present you a wide collection of funny messages for friends that you can post on Facebook or Whatsapp to cheer them up and make their day shine brighter. It’s nice to know that I have a company for spending my eternity in Hell. 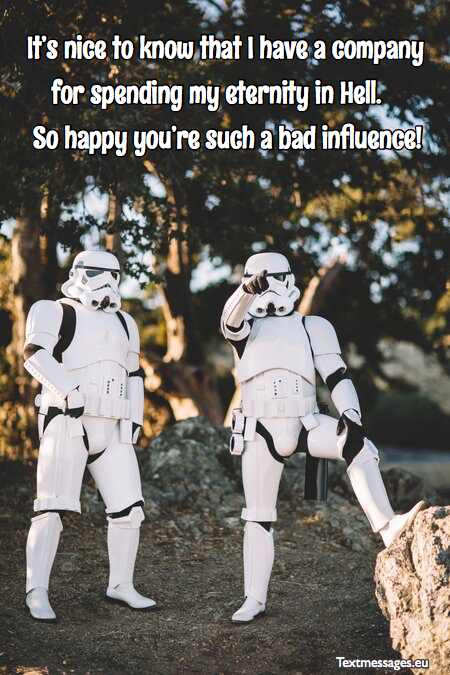 So happy you’re such a bad influence! Love you more than anyone in the world, buddy. I can’t stand you. You’re crazy, annoying, and you laugh too loud. Well, I guess you’re just like me. That’s why I can’t imagine my life without you, weirdo. If we were last people on Earth and there was just one piece of food left… I would burry you with all my respect. You’re going to have the best funeral, buddy! I can’t believe how lucky you are to have me as your best friend. I’m so jealous of you, mate. Just kidding, your kinda okay as well. Hey, gorgeous. Do you believe in friendship at the first sight? Well, I definitely do since I met you. Let’s get completely crazy together. Girl to shopkeeper: I am looking for a nice love card. Shopkeeper: Maybe you will like this one, it tells „To the only boy I ever loved“. Girl: This card is perfect! Give me 10 of them, please. There are two times when men don’t understand their women – it’s before marriage and after marriage. I never drink. Unless I am alone or with someone. Scientists have revealed that beer containes small traces of female hormones. They fed 100 men 12 pints of beer and observed that all of them started talking nonsense and couldn’t drive. Drunk went to a court. The judge said: „You are brought here for drinking“. The drunk replied: „Oh, great! So let’s get started!“. There is only one crush that is left after getting married… It’s “Candy crush”. Attention! Never text while driving, it’s dangerous, because you might spill your beer! Blind wife and deaf husband… what a perfect marriage! He doesn’t know the meaning of word “fear”. By the way, he doesn‘t know the meaning of many other words as well. I cannot think of anything worse than waking up after a night of drinking next to somebody and not being able to remember his name, how you met and … why he is dead?! What is the difference between talent and intelligence? Talent is walking on a rope over Niagara Falls. And intelligence is not trying such a thing. It is amazing that when you go into a spider web you automatically learn karate, kung fu and jujitsu! What is an alarm clock? Women have a lot of faults, while men have only 2 – everything that they do and everything that they say. You know, my wife doesn’t mind me flirting with other girls. In fact, their rejection seems quite entertaining for her. Being your friend is always having someone to eat with even if we’re both not hungry. I appreciate it more than anything in the world, mate, thank you so much. Let’s get fat together. I’ve realized that you became my best friend when you fell and got hurt and I couldn’t stop laughing at this. I think that’s what best friends do, right? Want to know why you eat chocolate, sweets and cakes every time when you are stressed? Very simple, it’s because the word „stressed“ spelled backwards is „desserts“. That everybody should have a friend like you. Why should I suffer alone?! Officer, I have found a bomb in my garden! It‘s all right, you can keep it, if nobody claims it within 3 days. Last night I lied down on my bed and started to look at the beautiful night sky, full of brightly shining stars and then I thought to myself… and where the hell is my roof now? And you hear some crack.. what would you pray for? You are my best friend, so If we lived in a post-apocalyptic world, I would kill you last. I think it’s the best compliment ever, and I really hope you’ll enjoy it. Love you! It’s nice to have a friend who can get you out of jail. But it’s even nicer to have a friend who will sit next to you in a prison cell saying “It was amazing, we have to repeat this experience”. We’ve been friends for so long, I can’t even remember why I started to hang out with you in the first place, weirdo. Just kidding, I think your amazing. Just in your own special way, mate.